Riviera Nayarit in Mexico is a veritable paradise for leisure and pleasure seekers of all ages and there are many opportunities for Riviera Nayarit timeshare purchases. Some of the ways that Riviera Nayarit is ideal for timeshare is thanks to its stunning sandy beaches that are safe for swimming, its modern infrastructure and selection of top hotels and resorts offering timeshare and vacation ownership. Timeshare at Villa del Palmar in Riviera Nayarit is a top investment. Villa del Palmar Flamingos, located in Nuevo Vallarta, Riviera Nayarit is one of the Villa Group’s best family resorts, voted by TripAdvisor users as among the top 24 family hotels in Mexico in 2014. Here you will find a selection of elegant suites, great restaurants, direct beach access, swimming pool and a stunning world class spa. At your Riviera Nayarit timeshare at Villa del Palmar Flamingos, you can access a range of suites including a deluxe suite, one, two or three bedroom villa suites as well as penthouses, each decorated with chic design and comfort in mind. Timeshare at Villa del Palmar in Riviera Nayarit include delectable dining. You can enjoy three restaurants and the Palmita deli as well as room service and beach/poolside snacks. All inclusive packages can be added to timeshare membership. 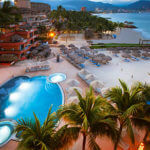 Nuevo Vallarta in Riviera Nayarit is renowned for having one of the longest stretches of sandy beach in the area. The beach at Villa del Palmar Flamingos is safe for swimming (at your own risk) and clean. You might even catch sightings of turtles as they come to lay their eggs upon the sand. The multileveled lagoon-style pool at the resort is a great attraction for both kids and adults taking advantage of their timeshare at Villa del Palmar in Riviera Nayarit; there are plenty of loungers for relaxation too. A conference room, fitness center and mini market all feature in addition to a packed program of free resort activities. And last but not least, the spa at Villa del Palmar Flamingos is a stunning example of zen-like design and luxury. The perfect place to spend the afternoon relaxing with a massage or beauty treatment. Riviera Nayarit timeshare doesn’t get better than this! 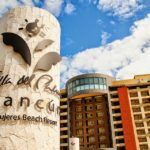 Share the post "Membership for Riviera Nayarit Timeshare at Villa del Palmar"